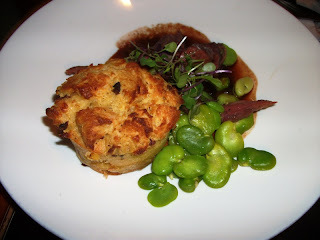 On my most recent trip to Walt Disney World, the trip for the 2010 Half Marathon, I had the great pleasure of dining at a restaurant that not only has one of the most adventurous menus on property, but I also had the great joy of dining there with my very good friend Andy Jackson of Eating (and Drinking) around the World. The restaurant was Artist Point and, while the menu excited my taste buds and the décor inspired my other senses, I thought this review would go a little differently. This time, I am going to let to food speak for itself, with a few notes here and there from myself. 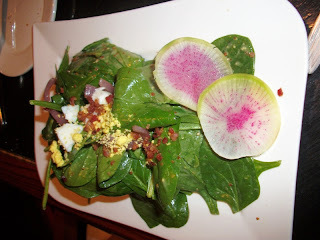 Spinach Salad with Crisp Bacon, Radishes, Hard-cooked Eggs, Pickled Onions, and Mustard Vinaigrette – Tasty, but not the most unique item that can be found here. 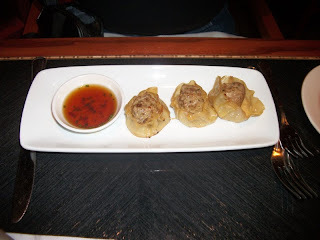 Venison Pot Stickers with Tamarind Ponzu – Tender and crispy, and the tamarind seals the deal. 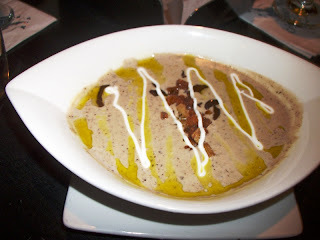 Smokey Portobello Soup with Roasted Shitakes and Chive Oil – The interplay between the Portobello and Shitake paired with the creamy base made this to die for. 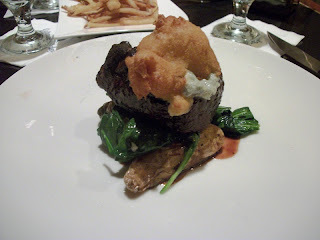 Grilled Beef Tenderloin with Roasted Fingerling Potatoes, Sautéed Baby Spinach, Blue Cheese Fritter, and Port Wine Reduction – Perfectly seasoned and cooked, but the rich blue cheese fritter is what sells this dish. Butter-poached Wild Boar Tenderloin with Wild Mushroom Goat Cheese Bread Pudding, Fava Beans, and Huckleberry Au Jus – I will bypass the Hannibal reference I am dying to make here, and simply say that the boar was masterfully prepared, but the mushroom and goat cheese bread pudding was so flavorful that the portion size could be ramped up just slightly and this side could be a dish unto itself. 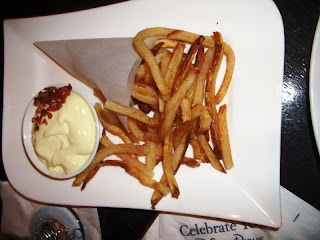 The atmosphere here compliments the fare perfectly, it is not pretentious but it calls for a more daring palate. 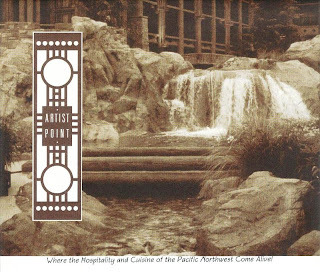 Artist Point delivers on service, taste, quality, ambiance, and style. I would say that Artist Point is family-friendly, but it is most certainly better suited for a quiet meeting, a great meal with friends, or a romantic rendezvous. In fact, I would love to go back again, not just for the full experience, but even simply to sample its whole leaf tea and dessert offerings. Artist Point is another culinary masterpiece in the Walt Disney World dining repertoire. So glad to hear that you had such a wonderful time. Our trips to Artist Point have been less than stellar, and I'd love to try it again! I have to say, when the restaurant first opened we had the most amazing meals there. Seems like the last 2 times I was there the magic was gone. Part of which seemed to be the change to more common offerings, but Ryan's meal certainly suggests a change back to the old, more exotic menu. Will have to see for myself in June, I think. So this is the meal you blew me off for...lol.. glad you had fun! Lori, you know I love you! You should come down in two weeks and we can go out to dinner so I can make it up to you! Tony and AJ, I've heard reports similar to yours' in the past few years, but it does appear to have turned a corner and climbing back up the culinary and service ladder! If you go, you may want to eat later. We were there in February, right when they opened. There were families with grandchildren or children who were not very well behaved. Maybe when the restaurant fills up, you don't notice the noise.